Tillie Jon Fox Turquoise Row Bracelet size 7 1/8"
Mathilda "Tillie" Jon is an accomplished Navajo silversmith who makes both traditional and contemporary designs. 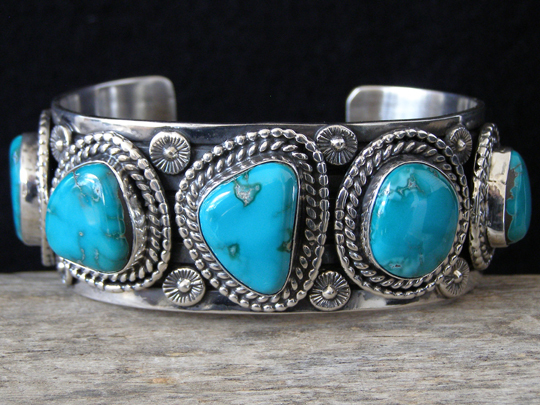 She does excellent stampwork and uses fine natural turquoise in her work. This five stone row bracelet is set with perfectly matched stones of natural, untreated Fox turquoise from Nevada. This is extremely fine-grained stone and it is polished to a lustrous, brilliant finish. Fox turquoise is known for its hardness and resistance to fracturing, as well as its unique shades of blue-green coloration. Tillie set these stones in smooth bezels and wrapped them with twist wire, then wrapped the twist wire with raindrop wire. She added small round blossoms between the stone sets along each edge of this uniform-width cuff. Horizontal grooved stampwork marks the cuff to the terminals. Hallmarked T.JON and stamped STERLING inside. Stones: center 3/4" x 9/16"; left 5/8" x 5/8"; right 11/16" x 9/16"; far left 11/16" x 1/2"; far right 9/16" x 7/16"
Uniform width of cuff: 1 1/8"
Total inside circumference (including gap): 7 1/8"